I know you want my Appams and Crackly Prawns. XOXO, Karama. Ever seen that row of South Indian restaurants in Karama, all sitting cross-legged next to each other, selling appams and fish curries and dosas just like the southies next door? Let’s call it Little South India for the purposes of this post. Each one always feels like its buzzing. Aaryas, Saravanas Bhavan, Calicut Paragon, Aapa Kadai, Chef Lanka, Anjappar Chettinad…I’m sure there are more. They’re always deep-frying a vada or steaming an idli with zeal, even though it’s just a two second decision for a loyal customer to defect to one of their neighbors for his sambar fix. Go there on a weekend dinner, and they’re all cramped up. Go there on a weekday lunch, and they’re not awkwardly empty either. Little South India is like one of those jam-packed smoky street bazaars, everybody makes his buck. And each place has its devout fan following. I’m relieved that they have their patrons despite being lodged one against the other. It would break my dosa-loving heart if one of them were to shut. We were pretty conservative in our ordering strategy that day (aka mom is a nutritionist.) But the food was simple, soulful and heaped graciously with the signature ingredient of Little South India: coconut. 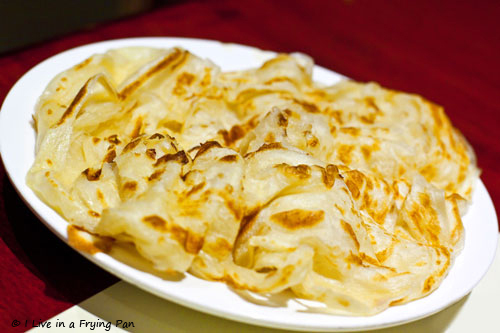 The Most Poofy Dish of the Dinner award goes to this puffy undulated terrain of a parotta, with airy peaks that protrude out of a fried, elastic, well-oiled but not greasy, stretch of dough. Never make the mistake of confusing the South Indian white flour-based Parotta with its North Indian wheat-flour Paratha predecessor. It’s the pizza equivalent to mixing up New York thin crust with Chicago deep-dish. Major foodie faux pas. Mom’s curry accompaniment-of-choice were these lacy coconut-milk and rice flour appams. I’ve spoken about the sponge-like properties and dipping utility of appams in my Aapa Kadai post in more colorful detail, but the two part bottom-line is: (1) rip crunchy perimeter of appam and dip in curry. (2) plonk finger in centre of the appam valley and sensually trace its spongy coconut milk skin…but still rip apart and dip in curry. The chicken curry was appropriately fragrant and well-seasoned. Nothing to throw celebratory rice from the rooftops for, and I’m not even sure what it was called anymore (maybe the Mulakittath). All I recollect was that it gave me the gravy pool I needed to dip the parotta and appams in. 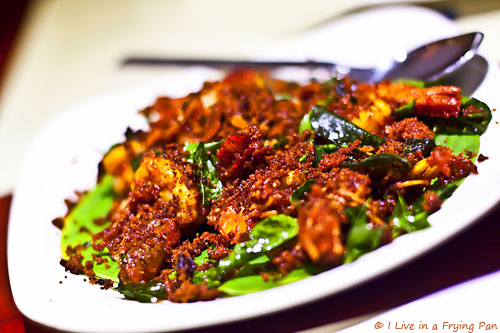 But the dish that became The Dish of the Evening, the dish that I mulled over for the next two days, and whose explosively crunchy coconut crumbs and fried fragrant curry leaves I can still taste in my mind’s mouth, was the Malabar Dry Fry Prawns. It was like someone had shaved off those crispiest edge bits of golden hash browns right over a bed of prawns, and dusted it with spice like there was no tomorrow. [Yes Potson, the spice brought out the The Crying Pan in me.] The most intriguing, yet slight creepy part of this dry concoction was that the prawns came intact with their hands and legs, all of which had been fried along with the prawn torso into brittle matchsticks that curled around the clumps of crunchy coconut bits. I’m quite sure that sounds vile to most people, but honestly, other than feeling a tad bit disturbed at the sound of crackling prawn limbs, I know that this dish will go down in my prawn memoirs for posterity. Now I know a bunch of you are die hard Calicut fans and have recommended entire lists of dishes that I’ve got to try at this place. I’ve failed you all, I know I have. I lost the darned lists. Be a paragon of Calicut virtue and send them again, I beg you. ← Older: Back from the dead. 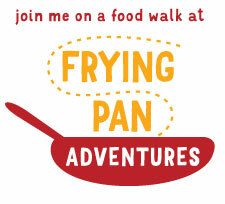 I Live in a Frying Pan still…LIVES. First of: Sheban and Chirag: THANK YOU FOR SAVING MY SITE. Very tempted by those prawns – want to tear them limb from limb. And that aapam…thanks to you actually know what an appam is and that this looks like a good one. Thanks for drawing the veil up a little higher on the mystery that is South Indian food (to me). Mishti – Oh God. I knew I would have missed some killer dish, I knew it. Not one, but so many in this case. The thought of crab curry in a clay pot and green mango salad is making me violent. I need to go back, NEED. TO. GO. BAAAACK. OMG! I just ate lunch but this post has managed to make me hungry again. LOVE prawns, and don’t mind the limbs, but did you have to eat the head too? What a wonderful feast and to enjoy it with your mom-extra special. Such amazing food. I have to make appams now. this post has me drooling all the way till the end of the post. 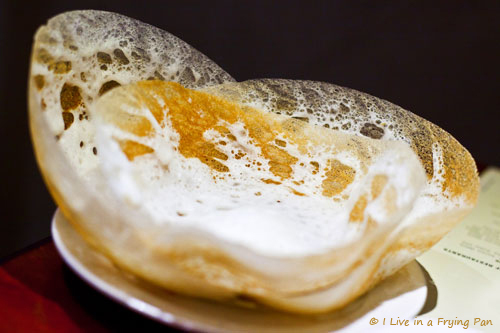 I think I should head to the kitchen to prep my batter for appams. Ohhh Arwa, this is the place I go to again and again!!!! I love it. Me being a Keralite don’t think I am patronizing the place, but believe me for me The northern Keralite ladies are magicians when it comes to food. The food that comes out of their kitchens are like heaven. 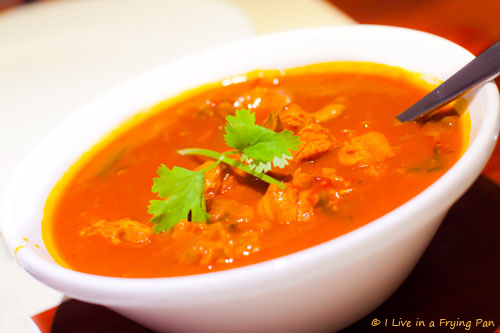 But Calicut Paragon is the place if you truly love the Malabar food culture. Next time you go, try the beef chilli, Kozhi nirachathu (stuffed chicken), Meen pollichathu(fish cooked in banana leaf) and meen mulakittathu(fish curry) for now I can think of only these things. but will surely post more things you should try from here. Zerin – you Calicut guru you, thank you! Your recommended dishes + Mishti’s recs for crab, mango salad, prawn pepper fry, stews, etc….are going to make me return with a mission. Keep adding to the list, I love walking in already mentally-drooling over the dishes I plan to order! I keep meaning to try these restaurants but still haven’t managed to! …actually, the scary thought is, you can imagine it perfectly can’t you? Me too. I need to fix my image. I live in a warm and cozy tea kettle.com. Or I live in a soft and happy souffle.com. FooDiva – yep, no sauce, just mindblowing coconutty crunchiness! Reading your articles in the morning is a crime, as all day you feel hungry – I did that mistake now and will have to live all day hungry. Would love to try the paratha and prawn curry – not sure if the prawns will taste the same as I had in Kuwait on my last visit – will to try if you take me once.